Like the title says, this is real basic stuff. Basically, it leans toward how to get a good snapshot after dark with a digital camera - this doesn't apply to film, because the technique would be quite different. Digital cameras have an amazing ability to "see in the dark" - so much so that sometimes, even though you might have taken the picture in the dark, it will still resemble full daylight. This is because of the high ISO's that digital cameras are capable of. Where drugstore snapshot colour film was typically available with an ISO of 400 (remember those days? ), a digital camera is just getting started there - newer DSLR's get up to 6400 with just a little noise, and a good quality small sensor compact can shoot a not-to-shabby 800 or even 1600. If then, you have your camera set on "full automatic", a very low light night scene will boost the ISO to a much higher value, seeking to maintain a bright picture. If you want to make your pictures actually look like they were taken after dark, you need to take some simple alternate measures. 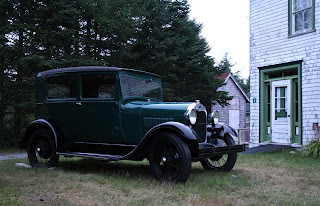 I took these three pictures just after twilight at the Atlantic Harmonica Festival in Lake Charlotte Nova Scotia. The setting is a quaint historic village where time stood still. As you can see, even though the sun had just set (and it was actually a cloudy night), my camera still picked up a lot of brightness, in spite of the "tricks" I had played. Technically speaking, I was on the right track, but I just didn't go quite far enough to emulate how dark it really was, so these are good pictures to talk about this particular demonstration with. I had my camera set for JPEG - I generally don't use RAW at events like this, because I don't want to deal with a lot of RAW processing afterwards. If I had been shooting RAW (and I could've been for these three pictures only, but I forgot), I would have had a lot more flexibility, but this is to show that even using JPEG, if your camera doesn't have RAW, is good enough for night work. If you have a camera with a "Night Scene" setting, then simply use it. This setting will automatically do what I'm about to describe. Mine doesn't have "Night Scene" or any other such things, because it's a professional grade camera that assumes the user knows what he is doing (and clearly I don't!) Anyway, just as well, because this is a demonstration on how to make a night picture, and the process involved, whether you do it yourself, or the camera does it for you. With my camera, I have to do it myself. So, I was set for JPEG, Aperture Priority, Automatic White Balance, Single Point Auto Focus and ISO 3200. These are the basic settings I was shooting the harmonica concert with, and I didn't change them. However, I did manage enough presence of mind to set a "deeper" Aperture of 5.6, down from 4.0 for a little more depth of field, and most importantly, knowing how I wanted it to look like a night scene, I set my Auto-Exposure Value for 1-1/2 Stops of underexposure. I can see now that I should have gone with 2 or even 2-1/2 Stops, but that's OK - this makes a perfect demonstration, if not perfect night photos. Naturally, I can still play with these in software to create a little more under-exposure, but that would ruin my demo. Just remember, ideally I should have been shooting with RAW, and with more underexposure. Now, what happens? If you had set your camera for Night Scene, that's it - you would have gotten a perfect night-looking JPEG. For me, it's a little different - I needed to do some work in GIMP (or Photoshop - $$$), because I ended up with rather dull, under-exposed pictures. So here's the trick. Do not try to compensate the dull-ness by raising the picture's Exposure Value or Brightness - that would simply get you right back to making the picture look like what the camera would have been automatically trying to do - full daytime brightness, except you would have a lot more noise in the picture, because you had already dialled in a lot of underexposure. If you re-boost the EV or brightness, you'll be boosting a whole lot of unwanted noise with it. Instead, you have to work on the pictures "Levels" and "Curves" in that order. When you open these dialogues in your software, you'll see a Histogram is provided. Because the pictures are under-exposed, you should see the Histogram is biased toward the lower end, with no values showing past the upper two-thirds (ideally). In "Levels", you'll see three little sliders underneath the Histogram - what you want to do in this case is work with the slider on the far right only, and drag it to the left toward the point where the Histogram "runs out of light". As you do this, you'll notice your picture brightens up the more you drag this right-most slider to the left. In actual fact, it's only the brighter parts of the picture that are being raised - the darkest parts are staying dark, and no (or not much) noise is being added. Do not slide it any further than where the Histogram bottoms out, or you will start adding a lot of noise. This is a lot easier to do than I just made it sound, by the way. Next, once you've adjusted the Levels, click OK and save the picture file. Now, open the "Curves" dialogue. This time you'll see the Histogram with a straight line through it at a 45 degree angle. You might also notice that the Histogram now has some "comb-teeth" through it (called "comb-filter effect") this is normal - the software is simply doing some noise-suppression from the adjustment you just made, and that's what it looks like on the Histogram. Now, what you're attempting to do here is to just boost the picture's very brightest highlights a little more, so using your mouse pointer, click and drag somewhere in the upper 3/4 of the diagonal line, and pull it upwards - the line will now curve up at that end. As you drag up, the picture's highlights will also brighten - don't go too far- just enough to make the picture pleasing to your eye, and that's it. Click OK, and re-save. These three things - underexposure, levels and curves are what your camera's "Night Scene" setting does automatically, so if you want to save yourself all this trouble, don't buy an expensive camera! 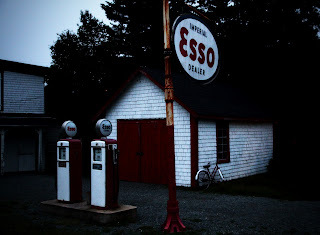 The fourth picture down, of the Esso Gas Pumps, is a better attempt at a night photograph. I took the time and followed what I had suggested above to a greater extent, using Photivo, because it has more features. Yes- Photivo can be used to do things with JPEG's. Functions that can be done in RAW only are grayed out. Basically, all I did was add another stop of negative EV (for a grand total of 2-1/2), then I played with the levels and curves further, using Photivo. Some noise appeared in the mid-tones, and to calm this down, I tried and kept three things - 1) Impulse Noise Reduction, 2) Orton Softglow, which does a nice "smear", making it look dreamy and hiding a lot of the noise, and 3) I added a heavy Vignette, which darkened the sky in the corner, further hiding noise that had appeared there.